5′ or 6′ Sliding/French Doors – Consists of a one-way draw, two-width wide fabric panel on a 1 3/8″ diameter fluted wood pole kit. This configuration fits openings up to 84″ wide. 8′ Sliding Doors – Consists of a one-way draw, three-width wide fabric panel on a 2 1/4″ diameter fluted wood pole kit. This configuration fits openings 80″ – 120″ wide. 9′ Sliding/French Doors – Consists of two panels that are two-widths wide and split draw on a 1 3/8″ diameter fluted wood pole kit. This configuration fits openings 96″ – 139″ wide. The Hatteras Sliding drape has proven the test of time in our intense rental market. 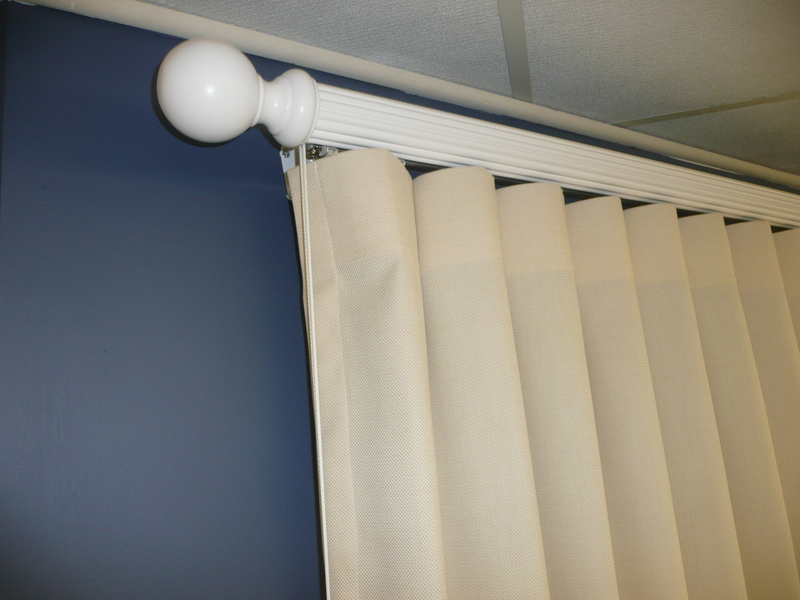 Daniels’ Homeport developed and has manufactured this style of drape over twenty years ago. 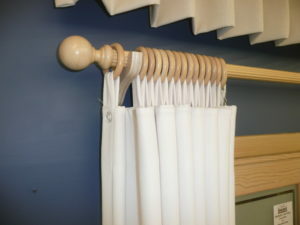 Today we sell nearly 2000 of the Hatteras Sliding drapes to the rental and personal homes on the Outer Banks each year. We stock two colors of Outdura’s Scoop fabric which is a 100% solution dyed acrylic fabric, Birch and White. The rods are available in nine colors including white, parchment, warm oak, walnut and more. wood fascia traverse rod. This configuration fits openings up to 84″ wide. 8′ Sliding Doors – Consists of a one-way draw, four-width wide fabric panel on a 2 1/4″ diameter wood fascia traverse rod. This configuration fits openings 80″ – 108″ wide. 9′ Sliding/French Doors – Consists of two panels that are three-widths wide and split draw on a 2 1/4″ diameter wood fascia traverse rod. This configuration fits openings 96″ – 120″ wide. Our Soft-stitch drape is a great solution for the homes with a higher-end look but still need the durability and functionality that a beach house requires. This drape system has been proven in even the toughest rental homes along the Outer Banks.